Indeed, "in shape" and "out of shape" are the extreme ends of the runner's fitness continuum. Our position on this line is always changing, and entirely relative. For example, last year at this time, I had enjoyed the fruits of an extended period of injury-free running. I competed in two track miles, running the second at a time faster than my high school PR. I also ran my fastest time for a 5k since I turned 40. Back then, I would have insisted that I was in "OK shape." I thought that my times were a good start, but I had more work to do. Now, however, I look back and marvel at the "shape" I was in. After struggling with an injury in the fall and winter, I witnessed my "shape" decline deeper and deeper. Since returning to running, each attempt to quicken my stride has fallen short of last year's accomplishments. After thinking about how and why we use this word, I decided to consult Dr. Google to see if I could figure out its origin. After five solid minutes of research, I didn't turn up much in the way of answers. 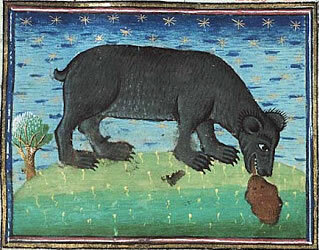 But I did unearth this little nugget from The Phrase finder website for "lick into shape," which, "sprang from the belief held in mediaeval Europe that bear cubs were born shapeless and had to be made into ursine form by their mother's licking." Rather, this is a mother bear "shaping" her offspring--or at least that's how Pliny the Elder and others imagined it. It is reasonable to assume that our fitness-related usage of "in shape"/"out of shape" connects back to this ursine urban legend. It is, after all, a metaphor for form coming from formlessness, order emerging from chaos. Running when you are "out of shape" is clumsy, awkward, and unfamiliar. As we improve, the movements and motions of the run become more familiar, more of a part of our ordinary flow. To be "out of shape," then, is to be in a state of anticipation, aspiring to be "in shape." No bear licks needed to get there. Just time, effort, good fortune, and some reliable folks to run with.